We have to find a balance between interrupting production and trying something that will improve production. As we increase capacity at a rate that outpaces our marketing experts we hope to have a span of time where we'll be able to have some freedom to experiment and optimize. Please tell us a bit about Purple and it’s experience in the manufacturing industry? The core group that we had when Purple started included several people with whom we have developed a few different new machines and technologies. The bulk of what we had done at the beginning was the startup phases of new machines and new technologies. We would typically get these up and running and then work through a license with another company and get going on some technology transfer. We all had a pretty good feel for the starting phases of production and we were able to quickly put everything together that we needed as demand quickly went crazy. The busier we got the more we needed to bring on more and more people to be able to deal with all of the volume. What were the manufacturing challenges Purple faced when kicking off its mattress development? The biggest challenges we've faced have been scaling. Because of the unique nature of our flagship technology there isn't anyone in the world that we could go to who is currently manufacturing this material in this configuration in this size. We've had to expand our own capacity to make more product to fill this need. We have found great vendors who have been fantastic at scaling up their production and supplying us with the equipment that allows us to produce to demand. We've been adding more capacity since we launched. We're also working on making the machines that we make a little bit better so that the next iteration will be more efficient and have higher output. It is becoming a bit of a dance between improving every machine and making machines that allow our maintenance team to have a job that is manageable with all the spare parts, tooling and equipment that they need to keep it all running. How did the engineering team handle the very rapid success with the mattress? The engineering team has had to expand significantly. When we started I was the only engineer and now we have a whole team of mechanical, manufacturing and electrical engineers. Going back to the unique nature of what we do, we've needed to get everyone adjusted over to the differences in our process and materials but we've been able to get great people who have taken it all in stride. We have a really great team pulling it all together. How does the new facility accommodate Purple’s unique manufacturing challenges and the significant company growth? The new facility gives us the room for the growth that we've needed to add new machines and manufacturing processes. Within that space, it has also allowed us the freedom to explore a little bit on what the best flow and layout needs to be. It allows us to take a little bit of time to decide which strengths we'll focus on in our manufacturing and how we'll be able to partner most efficiently with our vendors. What do you anticipate in terms of future growth, and innovations? Our founders have pushed very hard to have an innovative core and keep that as one of our values. We've taken a challenge from them to make life more comfortable for a billion people. We will always have to make money and we'll need to take of the business side of things but we will be creating real technologies and products that do make life better. Talk about your engineering team – how big is it? What kind of expertise is needed to manufacture Purple’s proprietary hyper elastic polymer comfort tech? The engineering team is up to about a dozen members now with mechanical, manufacturing, chemical and controls engineering. As with a lot of people the path everyone has taken to get here has been pretty diverse and schooling isn't the only thing we've relied on to become the team that puts this all together. Becoming experts in molding hyper elastic polymer and the associated technologies has had more to do with being able to adapt, apply valid knowledge from previous experience and collaborate well in a team. Are there other processes or systems that you are looking into to further streamline your production? Yes. Every day. We have to find a balance between interrupting production and trying something that will improve production. As we increase capacity at a rate that outpaces our marketing experts we hope to have a span of time where we'll be able to have some freedom to experiment and optimize. There are a few things that we see as low hanging fruit. Purple is a leading comfort technology company, which designs and manufactures products to improve how people sleep, sit, and stand. It offers cushions, pillows, and other comfort products using its proprietary Hyper-Elastic Polymer® technology. All products are focused on founders Terry and Tony Pearce’s vision to improve comfort. 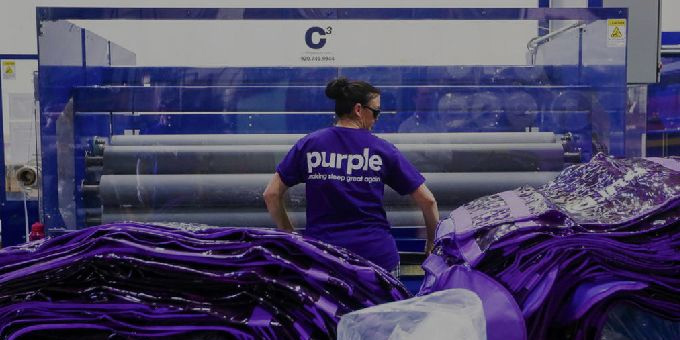 Purple continues to be a disruptor to the traditional mattress industry with its innovative products, packaging and shipping, direct-to- consumer sales, and generous trial and return policies.